There’s no reason to spend a ton of money on a pretty tote when you can make one you love yourself! 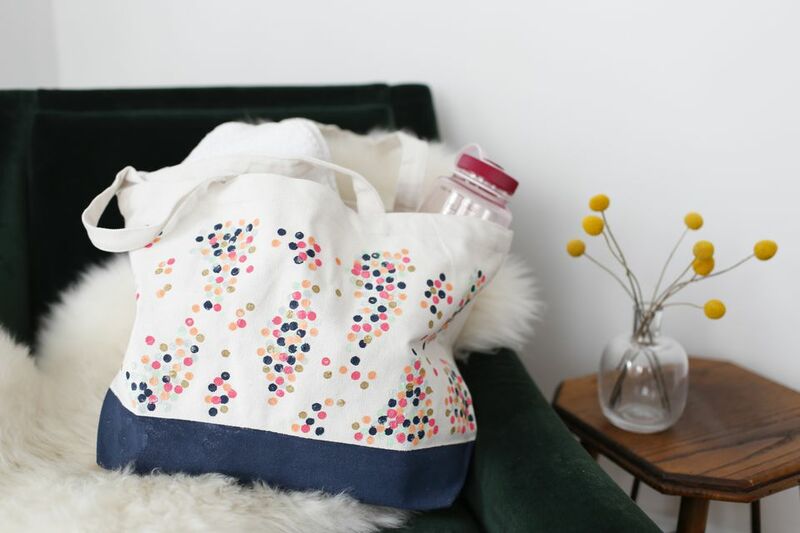 This project can be as easy or as complicated as you want, but the result will always be a handy to-go bag that will work whether you use it for your gym clothes and a yoga mat or a trip to the local farmer’s market. While this is definitely not the only way to create your own tote bag, the below materials are what we used for this particular look. Craft paint comes in so many colors and can be used on fabric. If you’re a beginner, you might want to try Sharpie markers, iron-on transfers, or stencils to start—which obviously would cause your materials to change. Start by deciding what you want to put on your tote bag. Maybe it’s one of your favorite quotes, a pretty pattern, or a favorite illustration. But before you even look at your paintbrush, you’re going to want to figure out what your plan is. That means possibly even doing a rough pencil sketch on the cloth tote or making sure your paint/marker colors will work together. If there are larger areas that you want to paint one solid color, use painter’s tape to mark off the area. Paint any larger areas first. If you’re using craft paint, just keep in mind that you will need to apply more paint than you think because the cloth will absorb it. Let the first layer dry and go back and cover any spots that are missing color. For this particular dotted pattern, you’re going to want to establish the base layer of color, starting with the lighter shades of paint. If you start with your darker colors, the top layer won’t be able to properly cover where needed. Using a pencil eraser (new so the eraser is the perfect round shape) dip it into the paint and firmly stamp to form a dot. Repeat until you’re satisfied with the base of the design. Clean off the eraser between colors. This design is all about the layers. Go over the base colors of light green and light grey with the darker/bolder colors like navy, peach, and pink. The mixture of both cool and warm colors makes this pattern feel livelier. To finish it off, a few dots here and there of gold paint add a glitzy touch. Definitely resist the desire to immediately throw a bunch of things into your cool new bag. While it might look like it’s already dry, the paint does take some time to soak into the fabric, so it might look dry, but it won’t be dry to the touch. Hang it somewhere cool and safe to dry overnight to make sure you don’t smudge your design.